Well researched, ambitious, and absorbing, this first-rate history lesson details the construction of a spinning mill with a good deal of social history interwoven. Honorable Mention, 1995, in the category of Excellence in Design and Production, Professional/Scholarly Publishing Annual Awards Competition presented by the Association of American Publishers, Inc.
Kenneth Frampton’s long-awaited follow-up to his classic A Critical History of Modern Architecture is certain to influence any future debate on the evolution of modern architecture. Studies in Tectonic Culture is nothing less than a rethinking of the entire modern architectural tradition. The notion of tectonics as employed by Frampton—the focus on architecture as a constructional craft—constitutes a direct challenge to current mainstream thinking on the artistic limits of postmodernism, and suggests a convincing alternative. Indeed, Frampton argues, modern architecture is invariably as much about structure and construction as it is about space and abstract form. Composed of ten essays and an epilogue that trace the history of contemporary form as an evolving poetic of structure and construction, the book’s analytical framework rests on Frampton’s close readings of key French and German, and English sources from the eighteenth century to the present. He clarifies the various turns that structural engineering and tectonic imagination have taken in the work of such architects as Perret, Wright, Kahn, Scarpa, and Mies, and shows how both constructional form and material character were integral to an evolving architectural expression of their work. Show More Frampton also demonstrates that the way in which these elements are articulated from one work to the next provides a basis upon which to evaluate the works as a whole. This is especially evident in his consideration of the work of Perret, Mies, and Kahn and the continuities in their thought and attitudes that linked them to the past. The culmination of a lifetime’s design practice and environmental study, Natural Energy and Vernacular Architecture presents a master architects’ extraordinary insights into the vernacular wisdom of indigenous architectural forms that have evolved in hot arid climates. This book has a traditional and philosophic view to the effects of environment on man and his architecture; this view could be affected by its authors, especially Hassan Fathy. This book includes two parts. In the first part we can see the relationship between Man, Natural Environment and Architecture as three impressible factors. This part of book is in two chapters. In chapter one, we become familiar with relationship between environment and architecture, the effect of climate on architectural form, environment, conscious modification of microclimate and finally trends in international architecture. Chapter two includes architectural thermodynamics and human comfort in hot climates, temperature, thermal conduction and resistance, radiation, emissive, absorptive, and reflectivity transparency. In other sections of this chapter we learn about thermal convection, atmospheric pressure, water vapour, cooling by evaporation, thermal gain, thermal loss, dynamic thermal equilibrium, heat-regulating mechanisms of human body, and measurement of conditions of human comfort. The second part tends to natural energy and vernacular architecture. This part includes four chapters. In first chapter of this part – the third chapter of book – we can learn about architecture and comfort, architectural design for a comfortable microclimate, and building materials. Chapter four assigns to the sun factor, orientation, shading, facades, openings and the roof. Chapter five is in the wind factor in air movement, air movement by pressure differential, the Claustrum, the wind-escape, the Malquf, and the Badgir. As the sixth chapter we can know in the sun factor in air movement, air movement by convection, the courtyard house, the Takhtabush and traditional city layout and climate. For chapter seventh the humidity factor, the fountain and the Salsabil have been seen. Two thousand years ago the Roman architect Marcus Vitruvius Pollio wrote the first book on architecture. It established the concept of the pattern book — showing design principles and solutions. This publication is today’s pattern book of green design. Sustainable architecture offers more than simply environmental benefits. It creates place-sensitive buildings, a location-specific architecture responding to local climatic conditions and using local materials instead of global cookie-cutter solutions. It also offers better architectural quality with more natural and fewer artificial inputs. Less is more, and less is beautiful. 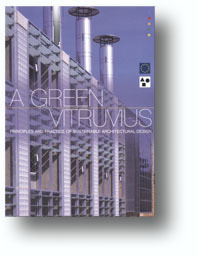 The book is divided into four sections, which structure advice according to the design and construction process, the issues to be considered, the strategies to be adopted and the elements of green design. A fifth section advises on design evaluation. Sustainability is one of many considerations for the practicing architect. This book is for the experienced practitioner anywhere who wishes to make a more sustainable architecture whether or not they have yet acquired any particular expertise in the subject. It will also serve as a valuable introduction to the subject, and provide a clear and attractive text for students. Published in the United Kingdom. Illustrated with more than 175 photos and renderings, this book shows how the spaces we inhabit, from our public streets to our homes, can transform us. An award-winning architect identifies the fundamental design forms that have evoked a spiritual response throughout time, and relates these patterns to the elemental patterns of human awareness. Each chapter offers exercises and practical suggestions. Lawlor puts into words the transcendence that I have experienced in involving myself in the construction of a dwelling, but have been unable to adequately express in words to others. His intertwining Eastern, American Indian and Western philosophical expressions into the architectural expression of our inner experiences makes a connection for me that furthers my understanding of my experiences in defining space, through conception, design and construction. Twenty-five articles from Fine Homebuilding magazine cover nearly every exterior project or problem, from siding, painting and flashing to gutter replacement, deck building and stair construction. A breathtaking and profound book. It is amazing how a book that propounds revolutionary architectural theory has stirred up the computer software industry. This deeply philosophical book, which is very practical and rigorous, lays the foundation for developing pattern languages. The book is all about a common language that can be shared to build artifacts that are alive. It stresses that a design should always concentrate on the whole and not on assembling parts. It also shows the power of distributed processing, if you will, as against centralized processing. All the great principles have one thing in common. They are simple. And, after one realizes such a simple but profound principle, one can not stop wondering how one survived without its knowledge. This book gives that feeling. If you are involved in architecture of any sort- buildings, software, organization or even politics- this book is a must for you.